A semi-auto pistol is loaded with magazines of rounds. To get the rounds into the magazine, you have to load them in, one at a time. This can become tedious real fast, especially if you&apos;re trying to load numerous magazines by hand. That&apos;s where a magazine loader can really help out. The Super Thumb magazine loader takes all of the pain out of loading high capacity magazines with strong springs. The Adco Super Thumb magazine loader allows you to easily push rounds down into your magazine, without hurting your fingers or slipping. Loading magazines becomes a quick, painless procedure, which gives you more time for shooting. 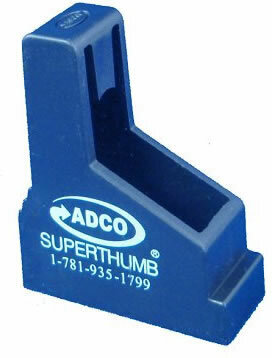 The Adco ST3 Super Thumb magazine loader is for single stack magazines and made of black polymer.